What a fun coat! It was a gift from my hubby and it is really super cool! Seems like everyone is wearing the long down coats lately that they have begun to look like uniforms. This coat is a great length and is super comfortable. I have yet to wear it without some stranger complimenting it~ Would definitely recommend ! Wonderful winter coat. The coat will look great with jeans for a casual look or boots and dress for a dressier occasion. If you are looking for a coat that is a little different this one is for you. You will not be disappointed. Cons: not for the larger women..
Soft materials, great quality. Wonderful colors. This is a super comfortable lightweight jacket that is cozy and warm. It is a great length for full coverage on chilly days. Great all around everyday Jacket. Makes a wonderful car coat. It has double zipper for comfort while sitting. 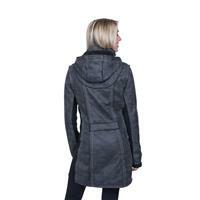 Soft fabric detachable hood for versatility. Two different looks. Warm and cozy. Flattering fit.